A horse who was bought to give a club of owners some fun landed one of The Festival's championship races today, providing trainer Harry Fry with his first 'official' winner at the meeting. Fry has been credited with plotting victory for Champion Hurdle winner Rock On Ruby in 2010, while based at a satellite yard for trainer Paul Nicholls. Now a trainer in his own right he got off the mark when Unowhatimeanharry won the Albert Bartlett Novices' Hurdle under Noel Fehily. An 11/1 shot, the winner beat Fagan (33/1) and Champers On Ice (20/1) by one and a quarter lengths and one and a half lengths. 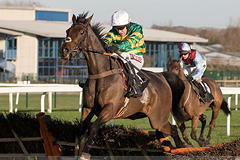 The Pertemps Network Final was the plan for Unowatimeanharry, but a win at Taunton caused a rethink. Fry said: "At the start of the season he was a 123-rated hurdler and the plan was simply to win a race for the [Harry Fry Racing] Club. It didn't matter where - just to win a race and give the members a day out. First time out he won a conditional jockeys' handicap at The Open meeting, so to end up back here winning the Albert Bartlett is extraordinary. "Noel was brilliant and just let them get on with it. As always in this race it was a furious gallop and Noel was cool. He said he might not have been on the best horse, but he's as hard as nails and tries all day. He kept battling and kept finding on the rising ground. "The plan was the Pertemps. Two days after he won a qualifier for that race at Exeter I rang the handicapper thinking we might get a 7lb or 8lb rise, which he won off 138, and he said 'that is the best staying novice hurdler performance I've seen all season'. I nearly put the phone down on him! "He said you are nearly going up 12lb to 14lb, which will put you level with Barter's Hill and company. Martin Greenwood, the handicapper, said 'if I was given the choice I'd take your horse', and that gave me the confidence to aim for the Albert Bartlett. We thought long and hard, because he had made his mark in handicaps. "We bought him last summer, thinking he had the right profile for a club horse. He was a maiden, so he gave us lots of options - he had a bit of form and we could run him regularly for a bit of fun. There are 40 members and four horses in the Club, but for him to do this for them is extraordinary." The Gordon Elliott-trained Fagan stayed on strongly up the Cheltenham hill but couldn't quite reel in the one and a quarter length winner, the Harry Fry-trained Unowwhatimeanharry. The 33/1 shot, owned by Ronnie Bartlett, whose company Albert Bartlett sponsored the race, had plenty of ground to make up as the field turned for home but responded to some strong driving from his jockey, Davy Russell, to take second place up the hill, with the David Pipe-trained Champers On Ice a further length and a half back in third. Russell was happy enough with the performance of the runner-up following the race. "He's a tough horse," said the jockey. "He travelled well. You need to be on the bridle round here, which he was for the majority of the race, and he stayed on well." Tom Scudamore, jockey of Champers On Ice, was looking to the future for the 20/1 chance after the race. "He's run a tremendous race," said Scudamore. "He's going to be a fantastic staying chaser. I was flat out for a long way but hasn't he kept on well? He's kept on at the one pace. In an ideal world, it would have been nice if we'd have had a bit of rain last night but that's all in hindsight. "He's handled everything, travelled well and is continuing to improve." Ben Pauling gave no excuse after Barters Hill's fourth in the Albert Bartlett Novices' Hurdle. The six-year-old son of Kalanisi was coming into Cheltenham with an unbeaten record from this season and last season and was last seen winning a Grade Two at Doncaster. He had been a solid favourite in the build-up to this year's Festival but drifted on Thursday morning and Pauling reported he had pulled out stiff on Wednesday morning but was fine on Thursday. Ridden by regular jockey David Bass and send off 4/1, Barters Hill made the running in his usual style but seemed to not have enough in his locker when Unowhatimeanharry, Champers On Ice and Fagan came knocking on the door, eventually finishing four and a half lengths off the winner. Pauling said: "He's run very well, I wouldn't be a trainer if I wasn't competitive and being beaten is not what I came here to do today. He actually got a lovely position and he's lobbed away and there were no hard-luck stories, the only thing I might think is that on genuinely good ground has he quite got the turn of foot the others have at the end. "He is as hard as nails and I am so proud of the horse. There are going to be plenty of other days ahead and we will look forward to those. I thought we might have to drop him in today but we didn't and in this absolute top-class we were unable to tear them apart." The trainer continued: "Coming round the home bend, I thought he'd win it. It was just unusual because normally in that position he only has to beat one but they were coming from every angle today." Commenting on possible future plans, the handler commented: "He will see how it comes out of it. We will bypass Aintree, if he is A 1, we might consider Punchestown but this was the main aim and he's done so well this season. Three miles might have stretched him a bit and I wouldn't be surprised if we dropped him back in trip, but I don't know. There was no hard luck story - we've been beaten today."